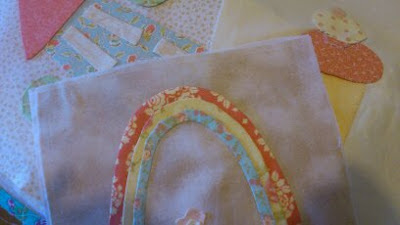 have enjoyed the lazy mornings and crafty days..
was thrilled Daddy was home to help do stuff! before Daddy did the final coat... aint this cute? as we were heading to Victoria for Easter but had to cancel. so I am taking it easy...well easy for me anyhow. 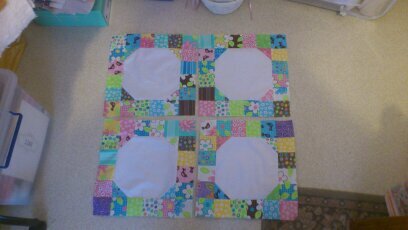 only a little bit of stitching to go and I can post finishes. He decided to do some chalk art outside my kitchen window for me..
Oh it cheered me up for sure.... I love him so much! Some Stargazer blocks and I just love how these come together so quickly. 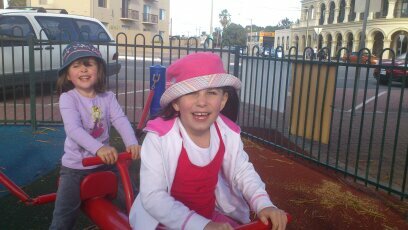 The girls had a blast and I got the delightful fresh air I needed. Hope your week has been fabulous too. Nice to hear you are slowly on the mend. You did keep busy in the hols with DH and the girls. 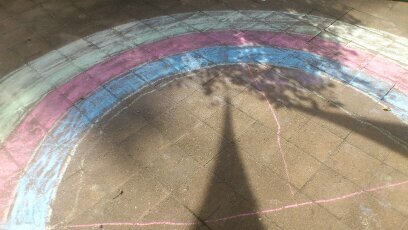 How sweet he drew a chalk Rainbow for you. You also managed some lovely stitching which is more than I did. Yay for hot pink and gorgeous little girls!!! 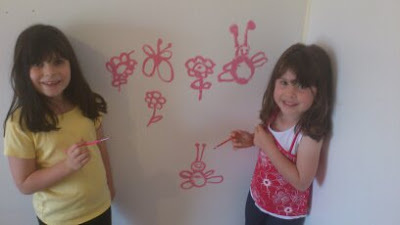 Love the rainbow chalk art, what a sweet thing to do. Feel better dear Dawn!!! Nice to hear you are feeling better, and it looks like you have been surrounded by lotsa love...the girls quilts are going to look fab.. The girls sure look like they had fun!! ... The pink is fantastic!!! And their paintings are beautiful!! I am sure DD would LOVE to have a chance to do that too, lol, she's been begging me the last week or so to do some painting, but our paints have gone bad and I need to wait till pay day to restock! ... 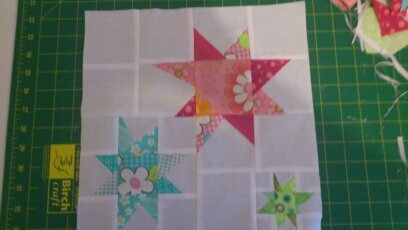 The blocks are gorgeous - the fabrics perfect!! ... Have a good week this coming week sweetie! Take some time to rest and get better soon!!! Hugs to all! !